Did you miss meeting other jagoinvestor readers and our team ? I am sure many did in Pune, where we did an offline readers meet recently. 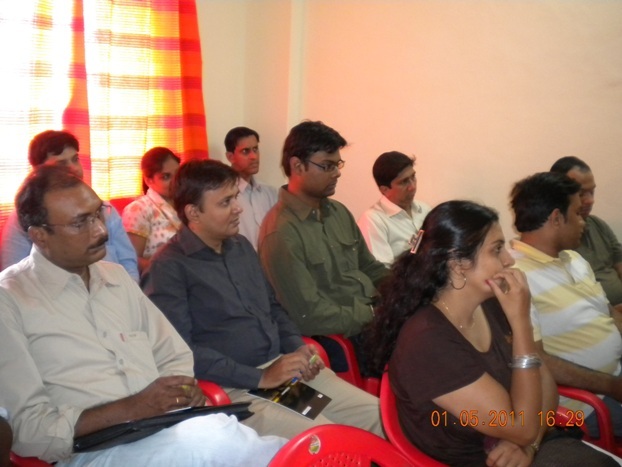 On 30th Apr (Saturday) we conducted an offline readers meet in Pune and it was well attended by 20+ readers . There were some last-minute cancellations, buts its part of the game, we need to accept it . In this article I would like to share 3 things . First, I would share what we all did in the event and what kind of things we discussed . Second thing would be the two things which participants experienced and its truely amazing I can guarantee you ! . At last, the last thing I want to share with you is our offline paid events which we are planning to do in various cities some time soon now . Lets start ! Last week, my team travelled from Ahmedabad to discuss some new and exciting things we are building and planning to launch by next year . And as the whole team was there in Pune, we thought why not have a readers meet and share some great things with them ! . We decided to have a readers meet at my residence and give a talk on what are the key reasons most of the people are stuck in their financial lives and how they need to change the way they are if they want to make things work . No data cruching, no product talks ! , the whole talk was only focused on how we as human beings make mistakes in our financial lives which we have inherited from various other parts of our lives ! . We started at 10:30 am and we ended around 2:00 pm. For all these 3.5 hours, there was a wonderful session on topics which were truly unheard of for almost everyone . It helped the participants to understand the real reason of what stops us from having a great financial life and why we are stuck in our financial life and not able to move forward ? We also did something called as “Money exercise” in between the session with all the participants (not in great detail , but just a small part of it) which we do with our clients as a “warm up” exercise. We knew that it would be something which would give some additional life to the whole session. Then we chose one of the random participants answer and discussed her answer in detail. Nandish Desai, my teammate did most of the talking (mind you, he is an amazing public speaker and you dont want to miss listening to him if you get a chance). The event was full of real life incidents and fun-filled one liners which really helped participants to understand the topics in an easy way . The simple examples made sure that they can connect what we were talking to their own financial life ! . It was not at a heavy session at all ! . It went better than what we planned and the feedback was great . Most of the participants really felt that some part of them has changed after the event and they are ready to go and implement things in their life from that same moment . The best part was that we also had Jayant, one of our clients in the group who shared with all how his life has accelerated and he has truely taken charge of his financial life. 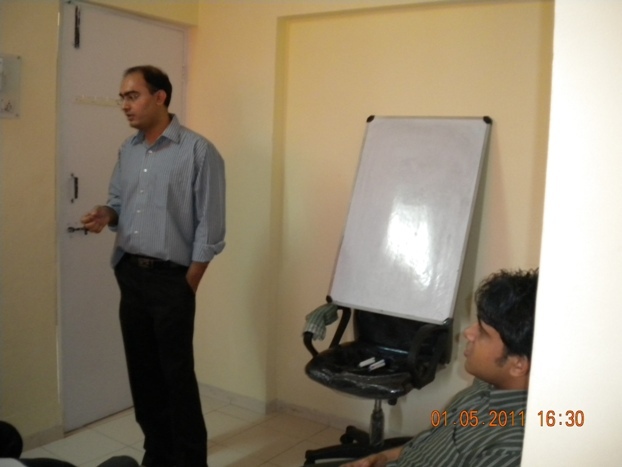 He shared how he took some tough decisions in his financial life which were pending from years and he completed them. He had weekly/monthly targets and we were after him to make sure he does not deviate from his promise of completing them .He shared how he is almost close to be “debt-free” and his financial life is now restructured . He feels his financial life has become more simple and easy for him to handle and understand too. He also have more clarity on how he has to move in his financial life from this point of time . Group is powerful, because the sharing and experiences is manifold in a group. I would like to share two things which I am sure would add a lot of value to your life and that comes directly from the group we had in the event . Few years back, I had to go for a medical check-up provided by my employer and I hesitantly went for it because it’s a headache in Mumbai to travel . As it was a benefit for free, I finally went for it , but not with full enthusiasm ! . I did all the tests and checkups which was to be completed. Doctor : “Welcome to the world of Diabetes” – Doctor said with joy, the moment he saw me and smiled at me ! Dhananjay was shocked ! , he had a blank face and truly speaking he had no words. How can he have diabetes at the age of 30 ? He was devastated ! . It all seemed like a dirty joke played by life on him. Dhananjay : But Doctor, I am just 30 , how can I be diabetic and I want to ask you, are you really sure I just have 5 yrs left in my life ? There might be some mistake in my reports ! . Doctor : I feel sorry for you , but I can’t do anything . You have ignored your health to an extent that fixing it is out of question now ! . You want to see more ! , See these blockages forming in your heart , they will kill you much earlier , forget 5 yrs ! . Dhananjay (almost crying now) : Doctor , I can’t believe all this , how it can happen to me ! , this is just not done ! , I don’t deserve this , my family needs me . I have not done anything in my life yet ! . Doctor : Ok Dhananjay , Calm down ! . Can you share with me how are you feeling ? Can you tell me whats going on in your mind ? What is that one thing which you really want to happen at this moment ! . Doctor : Ok Listen , The conversation I just did with you, Its not for the today ! , but future ! . You will hear exactly the same things from me , if you don’t take care of your health from now-onwards . Please do something about it and dont ignore your health . If you continue the way you are and ignore your health , believe me things will get more ugly then what they are right now ! So please go and start taking actions . Now, you can imagine how the next day started for Dhananjay ! . It was 7:00 am next day, Dhananjay was wearing a sport shoe worth Rs 5,000 (which he considered total waste at one point of time) and he was running in morning . That first day, it was accidently raining heavily in Mumbai , but to hell with rains ! . He was running ! . He was now committed to change things and improve this health . After that event, even though he gave excuse in other areas, but he never missed exercising each day without excuse. Not matter what ! . After an year, when he went for a medical checkup again, there were no traces of any problem and he was 100% healthy. He went to meet the doctor personally to really thank him to change his life , but doctor was not in India . He was abroad now, but Dhananjay really thanks him from the core of his heart ! . Do you see a link between what happened with what happened with Dhananjay and what happens with most of the people’s financial life ? Most of the people I talk to have ignored their financial life to such an extent that things become too tough to repair at times , I hope they get some shock therapy and can see a future picture of what all can happen with them ! . On of our client and his wife Soumya were present in the event. At the end of the session, Soumya was sharing with us (not the whole group, but to us personally) that how connected she feels with her financial life soon after they have taken those actions which were long pending . Earlier she was not bothered about whats happening in their financial life and it was just the husband who cared and thought about it. But once they have taken charge of their financial life, Soumya now feels more responsible and a strong relationship with her financial life . She is now an equal partner of her husband in area of money. Now each aspect of their financial life is discussed jointly and they come to a decision together . I think this is real financial planning and at a different level than what we hear everywhere else . It was great hearing Soumya’s experience and her feelings as they are unique and not so common in our indian families (read this) where only one partner is bothered and responsible for financial life and the other person with “Not-my-cup-of-tea” and “Not-interested” kind of attitude ! Now, I am fulltime on jagoinvestor and we have a dedicated team with each one of us having a unique area of expertise, we feel that we can now take our jagoinvestor movement to next level. Hence one of the things which we decided was that we will soon do value-for-money paid seminars and workshops in different cities in big groups which really adds value to participants and also help them in taking actions right then and there. We would like to understand first that how many people are looking forward to some thing like these workshops which would be a full 1-2 day event depending on the level of deliverables. Hence we are capturing the data of those readers who are willing to pay a fee and participate in these serious events designed for changing financial lives . We are thinking of doing the first event by this June-July 2011. Note that this is going to be a high value , extremely relevent and action oriented workshop which will literally move you from that comfort zone and activate things in your life. You can literally consider these events as events which will plan your financial lives and help you move forward, if you were stuck from years ! What you can expect from the workshops ? If you ask me – “Manish, Can you tell me in 1 line that what can I as a participant can expect from these workshops? ” . My answer would be “Once you complete the workshop, you will leave the room with complete clarity about your financial life and you will be clear on the next steps to be taken” . Apart from that we will also share many resources, tools and calculators, and many more action oriented exercises. This is what we have in mind right now, but we are yet to design it fully ! , so there will be much much more ! . Take my words ! Please note that these will be paid events and not a free one. Once we have many of people interested from a city, we would be sending details of fees , the program deliverables and what participants can expect out of it and many other information. Feel free to give your suggestions and ideas on these events . So are you ready ? Please share if you have participated in such personal finance programs already and what was the experience ? I was wondering over the last few months when you will quit your IT job and plunge fulltime into Financial Services. Congrats and all the best. I have been a big fan of yours and have been benefited by your site. I’ll definitely like to join one of your courses in the future when I am back in India. I have been investing in Stocks and mutual funds for the last 20 years but I do not consider myself an expert by any means so will like to learn more. I’ll send you a personal mail to see if I can use your services for my own finances. Great Going! Did you leave your job and get into this full time now ? One more question. A friend of mine is going abroad for long term and has lot of questions on personal finance. Do you think you will be able to help him ? What will be the time required for this exercise and which service plan of your’s would you advise for him. 1. Does he need to close all his savings bank account’s in India before moving abroad ? 2. He understands that he needs to open a NRI/NRO account, in to which he can deposit money from abroad, but will he be able to invest in mutual funds and shares from that account while staying abroad ? and service his home loan from account ? 3. Is it a good idea for him to take out his existing PF account accumulation and pre-part-close the home loan outstanding which he has. Since we are soon going to have the rule of no interest on inactive PF account. 4. Which is the most tax effective (legal 🙂 )way of sending money home from abroad ? 5. He want’s to give his home on rent. Does he need to do anything specifically, to get this rent in his bank account. In terms of taxation how is it going to be treated ? Do you think you will be able to help him out with answers to these questions and may be more by the way of personal financial plan ? 2. Yes , he will be able to buy sell the mutual funds in India from those account ,but then it would depend what kind of account is it ,. If its NRE , then the money can not be repatriatied back to india and if its NRO , then it can be . 3. I think it would be good idea to clear more mess here before moving abroad . I suggest he pre-pays theloan . 4. I have no idea on this , better he tries our forum , he will get hte answer for sure . 5. Its simple , he will be taxed for his income in India . thats all . so if he gets 12k rent , his yearly income is 1.44 lacs , well below the limit , No tax . If its above the taxation limit , then he will have to pay tax and file the returns . these are generic questions and can be answered .the paid services are only for cases where a person needs our involvement in transformtion of financial life ,.Its at very different level than just answering questions . Just to add to what Manish has already said. If your friend is going abroad for good then he should think about closing his PF and some of the other accounts. But if he is like most of us who hopes to return after a couple of years then my advice will be to keep most his money in India. Regarding point 4 he will pay tax on his income in his country of residence. Once that is done he can send any amount to India. That money will not be taxed in India s it is not his income in India. Any income that he earns in India like rent, interest etc will be taxed based on the total earning from these heads and as per the Indian tax rules. However, since his salary income will stop his tax liability in India will reduce drastically and may be zero. Was it really 30th May 2011 or typo. Wow nice initiative manish….. am damn sure that this workshop would be a nice awakening for the people about their financial life. I would like to recommend this workshop for my friends in chennai (am currently out of india and badly going to miss this)…. I would like to know estimated price range for the workshop in chennai with group of 20-25 people (I know the price would depend on number of people but still i would like to know rough estimate so that i can cajole my friends to attend)……. Thanks for all your encouragement. It is nice to see your commitment towards your friends. We can schedule a call to take it further. Put a mail to me on nandish@jagoinvestor.com or you can write to manish. We will send you our contact details. We would like to encourage groups and communities to participate and bring a change in their financial life.